Flood Watch – Lake Erie Shoreline / Erie Shore Drive – May 4, 2018 – 9:30 a.m. Environment Canada has issued a Special Weather Statement for the region and their Marine Forecast has also issued a Gale Warning for western Lake Erie due to predicted high winds this afternoon into this evening. The already strong winds are predicted to rise through the day reaching sustained wind speeds of around 60 km/hr late this afternoon before switching to a more westerly direction. Wind gusts associated with the peak winds are predicted to be around 85 km/hr. Wave heights of 2 m are expected during the afternoon. Winds are expected to drop to light conditions later in the evening. The strong winds from the southwest will be driving waves onto our Lake Erie shoreline in Chatham-Kent and Elgin County. There is a risk that wave action could damage shoreline protection works and cause shoreline erosion Vulnerable areas will likely see localized flooding due to waves crashing against shoreline protection works spraying water up onto the land. 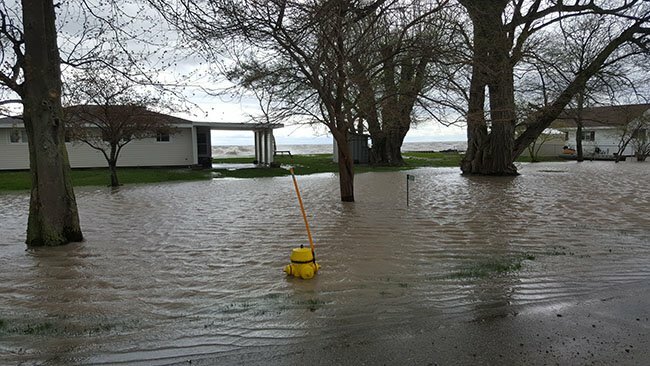 Over the last year, Erie Shore Drive in Chatham-Kent has experienced flooding when sustained wind speeds from a southerly direction (southeast through southwest) reach around 35 km/hr. The predicted wind speeds are well past that point and flooding should be expected. Residents along the Lake Erie shoreline should be prepared. Officials will continue to monitor the situation and update this advisory if necessary. This message will be in effect until May 5th, 2018.